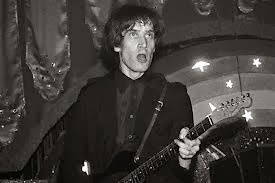 Britain, the rock & roll guitarist Wilco Johnson is a national treasure. and should have been dead by last October. Last night’s show was a one off. Here’s a a link to Wilco playing in Paris in 2010 with Norman Watt-Roy and Dylan Howe. It’ll give you just a small taste of what this big-hearted guitar player was all about. Going much further back, here’s a link to Wilco and Dr. Feelgood in their prime, playing a gig in Southend, England, in 1975.Well worth a viewing, if you can put up with the film’s drawn-out opening sequence of Southend pier, supposedly the longest in the world. UPDATE. WILCO JOHNSON HAS BIGGEST HIT FOR 40 YEARS. 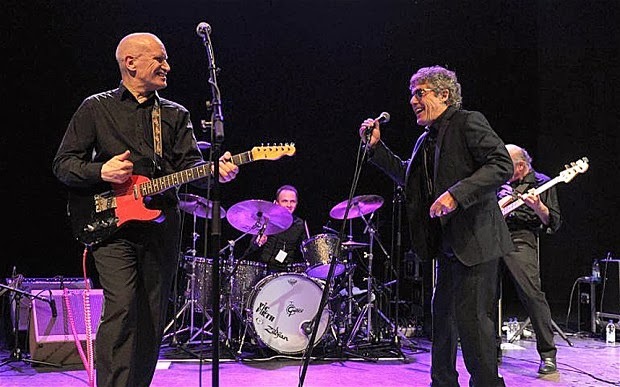 Wilco Johnson’s recent collaboration with Roger Daltry, Going Back Home, looks like being his biggest hit record for 40 years, when it’s expect to reach number two in the British album chart this weekend. Johnson, who has refused chemotherapy for terminal pancreatic cancer, last had a number one with his band Dr. Feelgood back in 1976.